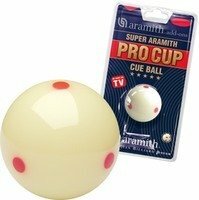 This is one of the most sought-after items in billiards. With six red dots on its surface, this "measle" cue ball makes it very easy to visualize the rotation of the ball; instantly showing any inconsistencies in your shot. The ball is regulation 2-1/4" in diameter and is regulation weight.